Lewis is pictured presenting the donation to Chris Manegold, Executive Director of the Alliance. 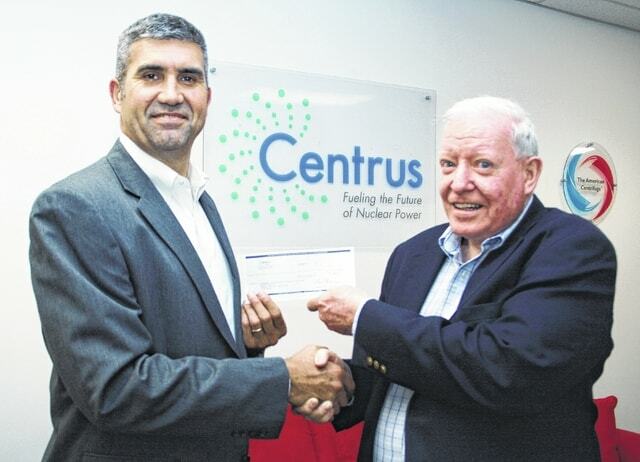 PIKETON, Ohio – Centrus Energy Corp. recently provided a $2,500 investment to the Economic Development Alliance of Southern Ohio. The Alliance is engaged in implementing an aggressive program of powering jobs and investment to create community wealth for the benefit of all citizens of Southern Ohio. Since its founding in 2006, the Alliance has assisted projects that have resulted in $36.6 million in capital investment and have created 762 jobs. In addition, the Ross County annual average unemployment rate has declined from 11.9% in 2009 to 6.2% in 2014.